All electric openers for garage doors now come with remote controls. Typically, two units are included in the package for maximum convenience. The clickers are simple to program and easy to use. However, they are not fully protected from malfunctioning. If any problem arises, you should be able to resolve it quickly and efficiently. Learn how to do this. If the door does not open no matter how hard you press the button of the garage opener remote, you need to ensure that the problem actually lies with the clicker and not with the opener. For this, you should use the wall switch to operate the door. Run the door for a full cycle. If it is opening and closing properly, then the issue is certainly with the transmitter. The most common cause of malfunctioning is the complete draining of the batteries. They have to be replaced right away. It is a good idea for you to keep spare batteries in your car as well as in your home to resolve the problem easily and without hassle. If the garage motor remote is still not working after battery replacement, you should reprogram it. You will find instructions for reprogramming in the owner's manual. They may be available on the manufacturer's website as well. The issue may not lie with the batteries, but with the battery contacts. If they are covered with a lot of dirt or with rust, the remote will not be getting power from the batteries. 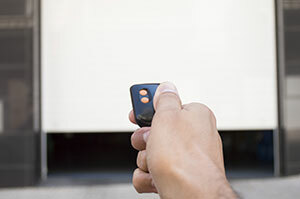 Such issues with the garage door clicker can be easily resolved in most cases. You simply need to use apple cider vinegar. Dip a cotton swab into it and then rub the contacts. You can add a little bit of salt when rust is present. Once the contacts are clean, the remote should start working properly again. If the problem is not with the remote, garage door opener repair may be required.